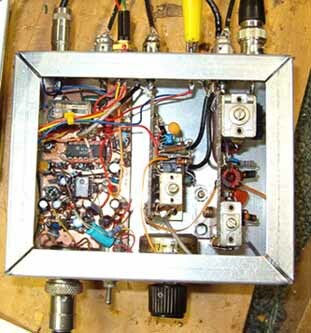 In this photo, you can see the pre-driver sub-board mounted alongside the TX mixer and balanced modulator. With some care, each module can be removed individually for servicing and adjustment. A small hole drilled into the side of the aluminum chassis permits adjustment of the 1st pre-driver's output circuit using an insulated alignment tool. 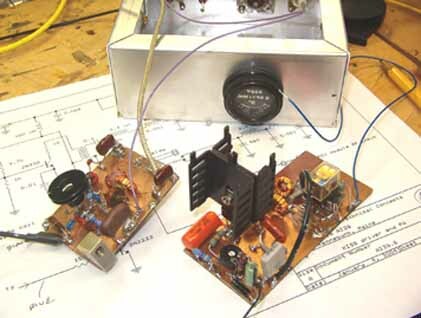 In a later version of these two stages, untuned broadband transformer-coupled pre-drivers were substituted for greater stability and much higher RF drive across the band. This eliminated the need for stagger tuning. 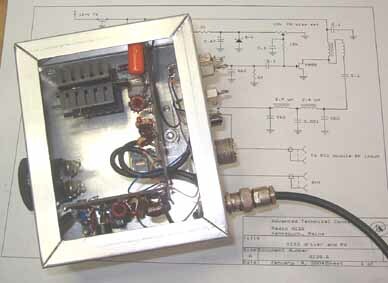 Here is the KISS transceiver's driver and final amplifier stages. The driver was originally a 2N338 NPN bipolar transistor. It's been upgraded to a 2N3866 (with the original emitter bypass capacitor removed). 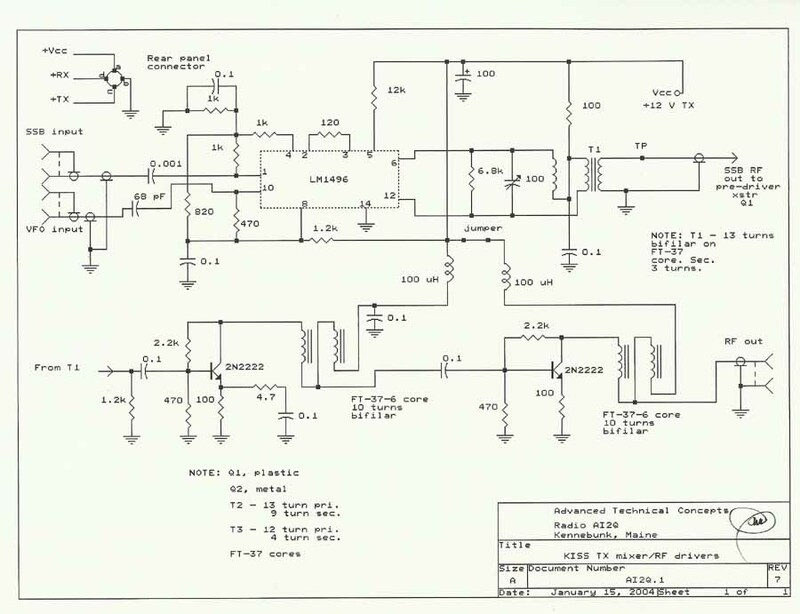 This stage is coupled, through a lowpass filter, to the gate of a VN88 MOSFET. The chassis in the background houses the separate driver and PA boards, as well as an output meter, changeover relay, and input/output connectors and power feedthru capacitors. 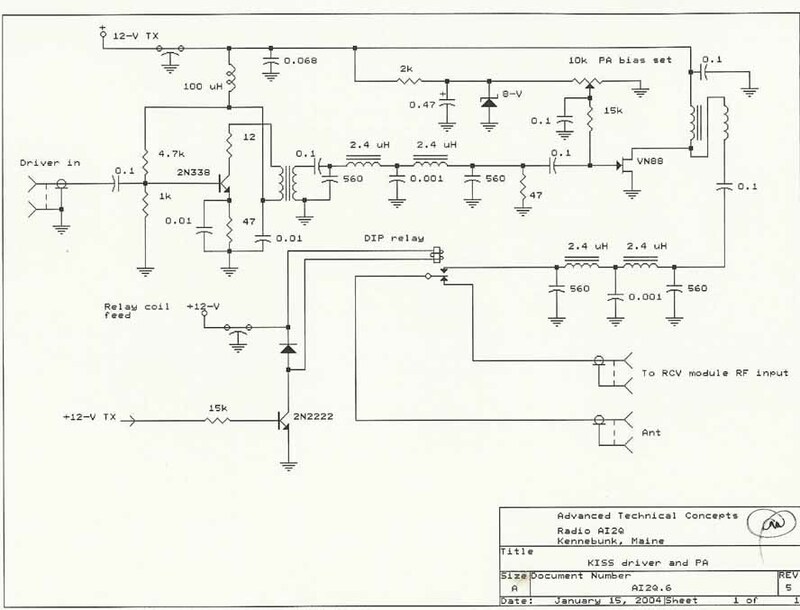 Click here to view the schematic for the driver and PA stages. Here's the driver board mounted along one chassis wall. 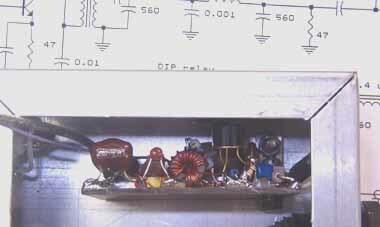 This photograph shows both driver and final power amplifier modules installed. Ahh....the moment of truth arrives. 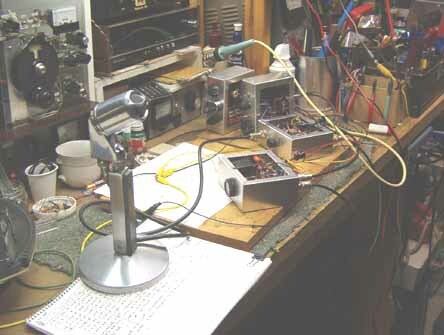 Feeling lucky, I hesitantly broke into an SSB roundtable at about 3.85-MHz at 0012Z on January 4th (2004)---and immediately caught the attention of KM1A, John in Connecticut. He gave me a 5 x 4 report! Ain't too bad for what I measure on my scope at about 600-mW PEP (calculated output power as P = E(peak)^2/2R = 8^2/2(50) = 64/100 = 640 mW). 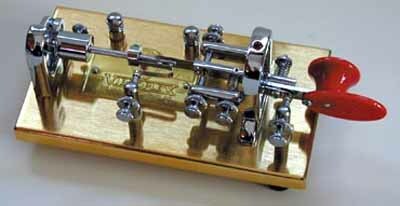 The exciting part of this milliwatt QSO was that other members of the roundtable chimed in! VE3VKH, Ray, in Ottawa copied me clearly, and I also got "clear copy" reports from other ops (didn't catch their callsigns, as I was so excited logging this) on Prince Edward Island and in New Jersey. A few minutes later and a few kHz up the band, I made another SSB contact with WB1AIJ, Bob, in East Hartford, Connecticut. 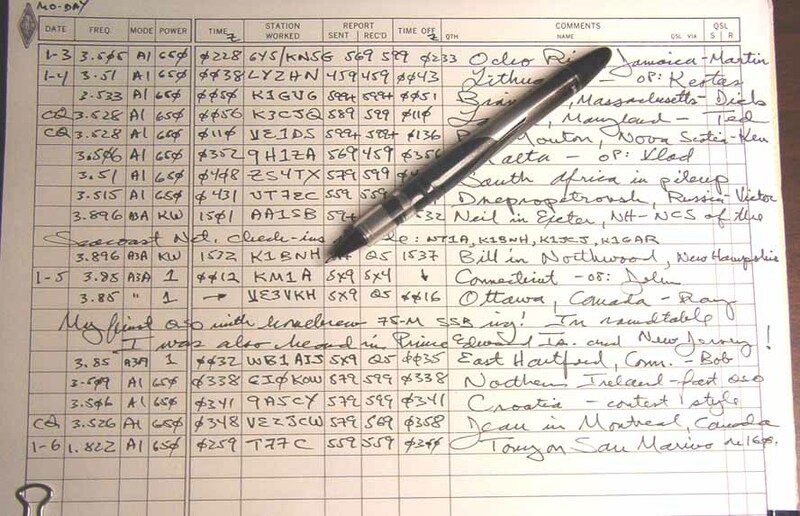 Click here to view the AI2Q logbook for the first QSO!